When Arthur and I decided to go to Hawaii for our first wedding anniversary we knew that Kauai was the place. It’s the smallest one of the main islands and also the most one that’s most remote. Plus, Kauai just happens to be famous for its many hikes, so of course we were hooked! But we didn’t want to go to Hawaii and stay in a resort by the beach and sip cocktails, we wanted to do it country style and fall asleep to lizards and birds! When I found North Country Farms, I knew right away that this was our place, and I can’t even begin to tell you what a magical experience it was. Scroll down to learn more about the cottage and find out our personal favorites from the island. As a guest at North Country Farms you get to stay in a little cottage right next to the garden at the organic farm, which has been run by Lee and her family for 30+ years. Situated on the lush north shore of Kauai, it’s hard to feel more “Hawaii country” than this. Wooden interior, surrounding palm trees and tropical flowers, roosters and chicken that welcome you home and kick-start your day (literally). The cottage is clean and homie and although the farm is small, you experience absolute privacy with your own little kitchen, bathroom, and outdoor porch. My favorite part about the whole place was probably the outdoor shower where you get to stand under palm trees as you wash yourself clean. There’s just something about taking a shower outside, especially in such a tropical and magical climate! “Once you’ve settled in, come great me in the main house down the path”. Staying with locals over an hotel definitely has its own charm and Lee is not an exception. She welcomed us with open arms and happily shared some history on the farm as well as insider tips on where to go on the island. Had it not been for Lee, we probably would’ve missed many of our favorites spots we got to see throughout the week! 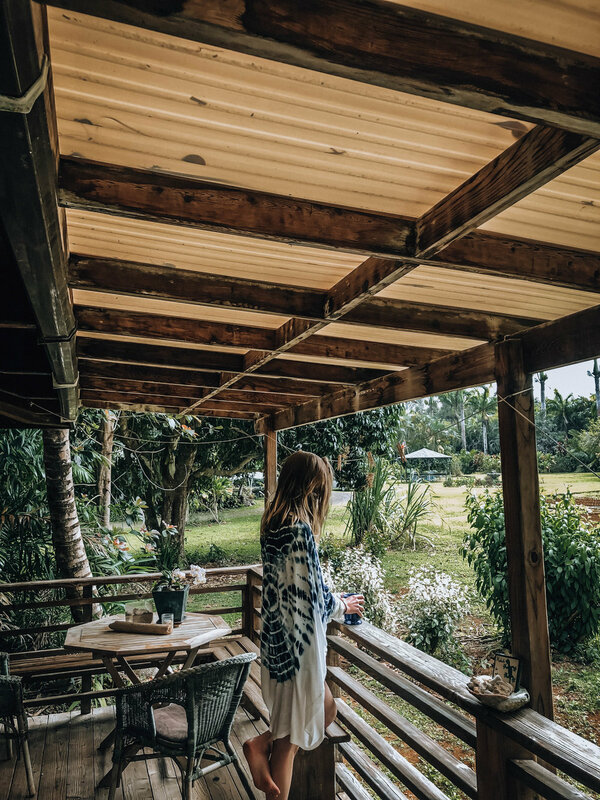 If you’re looking at Kauai for a dreamy get away I can highly recommend this cottage - check out more information and how to book here. Muddy, tropical, and strenuous in just the right way. Top that with breathtaking views at the ridge and you have Awaawapuhi trail! Located on the famous Na’Pali Coast line, this trail takes you through the jungle and out on the ridge. We did this hike on our first day and were not disappointed - definitely and it’s worth the drive across the island and up the mountain. Bring water, bring snacks, and make sure to take lots of photos. Showcasing a completely different scenery, this trail takes you to the center of the island where all around you is beautiful and lush. We’d suggest going early in the morning as it tends to get trafficked later in the day. We so wanted to do this hike but unfortunately this part of the island is still shut off from a serious storm that hit the island a little over a year ago. If you’re planning on doing this famous hike, please make sure to check before so that it’s not still closed. Being vegan on the go isn’t always super easy, but luckily we found some real gems on this small hippie island! GORGEOUS views overlooking the mountains, ramen to die for and no less than three vegan options. We went here twice!! THE best açaí bowls we’ve ever had. You. must. go. A food truck located in a little food truck cluster in Hanalei bay, with walking distance from the beach. To-die-for fresh burritos and many other good stuff - multiple vegan options! They’re only open for a selected few hours during the day so worth planning. Make sure to bring a snack on your hikes, just to avoid some unnecessary hangry situations… Visit one of the islands many farmers markets and bulk up on some fresh fruit and vegetables that make for perfect snacks! To book the cottage at North Country Farms, contact Lee via email: northcountryfarms@gmail.com or call 808.828.1513. Wanna jump on board the wave of change? Ready to take the first steps towards becoming the Eco-Warrior you? Sign up to my newsletter and get positive vibes and inspiration straight to your inbox!